Glaucoma surgery is surgery to lower pressure inside the eye. This procedure is done to treat glaucoma if other treatments are not effective. The inside of the eye is normally bathed by a clear fluid. The fluid flows in and out of the front chamber of the eye. In most cases of glaucoma, this fluid flows too slowly out of the eye. The fluid builds up and increases the pressure inside the eye. 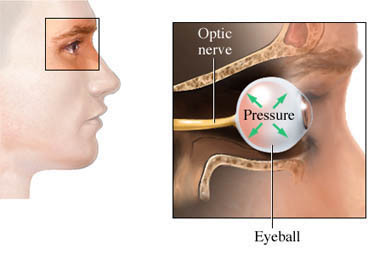 If this pressure is not controlled, it can cause damage to the eye and loss of vision. This surgery is done to lower the amount of pressure in the eye. Decreasing the pressure may be needed to prevent further loss of vision. It is important to note that while glaucoma surgery may save your remaining vision, it does not improve or restore sight. Talk to your doctor about your medications. You may be asked to stop taking some medicines up to 1 week before the procedure. Continue to use your eye drops, unless directed otherwise by your doctor. Drops are used to numb the eye for the procedure. Local anesthesia and sedation may be used for incisional surgery. General anesthesia is used under some circumstances. There are 3 types of glaucoma surgeries: laser, incisional, and alternative. The surgery you will have will depend on the type and severity of your glaucoma. Laser surgery uses a focused beam of light to make a small opening in your eye tissue to help drain fluid. The laser surgery you will have will depend on the type and severity of your glaucoma. Argon laser trabeculoplasty (ALT) : During this procedure, you will sit facing the laser machine. The laser "spot" will be applied to a special contact lens held on the front of the eye. You may see flashes of red or green light as the laser is applied. This procedure will allow more fluid to be released and relieve some of the pressure. Selective laser trabelculoplasty (SLT) : This procedure is similar to ALT. SLT has the benefit of being repeatable. ALT cannot be done more than twice. Laser cyclophotocoagulation uses a laser to destroy the parts of the eye that make the eye fluid. This procedure is usually only done in people who have severe damage from glaucoma and for whom other surgeries were not successful. Laser peripheral iridotomy (LPI) is a laser surgery used to treat closed and narrow angle glaucoma. During this procedure, the laser will be used to make a small hole in the iris. The hole will allow fluid to flow more freely within the eye. Incisional surgery uses tiny instruments to remove a piece from the wall of the eye. This creates a small hole, which is covered by conjunctiva (layer around the eye). The fluid can now drain out through the hole. It will then be reabsorbed into the bloodstream. This reduces the pressure in the eye. In some cases, the doctor may place a valve in the eye through a tiny incision. Trabeculectomy is surgery used to treat open angle glaucoma. A small flap is made in the outer white coating of the eye. Peripheral iridotomy (LPI) is surgery used to treat closed and narrow angle glaucoma. During this procedure, a small piece of the iris will be removed. The hole will allow fluid to flow. The procedure usually takes less than 1 hour. People having the incisional procedure may need about 4-8 hours from the time of arrival until discharge. For most people, the local anesthesia will block pain during surgery. There may be some burning or stinging with ALT and LPI. Some people report mild discomfort during the procedures. Incisional glaucoma surgeries tend to have more discomfort after the procedure than laser procedures. Refrain from heavy lifting, straining, or driving until allowed by your doctor. Angle-closure glaucoma. EBSCO DynaMed Plus website. Available at: http://www.dynamed.com/topics/dmp~AN~T901114/Angle-closure-glaucoma . Updated July 15, 2016. Accessed October 10, 2016. Glaucoma: What you should know. National Eye Institute website. Available at: https://www.nei.nih.gov/glaucoma/content/english/know3. Accessed May 26, 2015. How glaucoma is treated. The Glaucoma Foundation website. Available at: https://www.glaucomafoundation.org/treating%5Fglaucoma.htm. Accessed May 26, 2015. Open-angle glaucoma. EBSCO DynaMed Plus website. Available at: http://www.dynamed.com/topics/dmp~AN~T114157 . Updated June 2, 2016. Accessed October 10, 2016.